Warren Burt "Harmonic Colour Fields" CD - A set of five computer pieces which explore static microtonal harmonic fields, descending from the 1970s "drone" pieces of such composers as La Monte Young, Charlemagne Palestine and Burt himself. The microntonal drones on this are quite astounding. 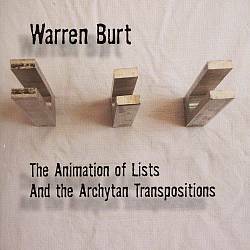 Warren Burt "The Animation of Lists and the Archytan Transpositions" 2CD - Absolutely astounding album of other-worldly music created with Burt's self-built just-intonation tuning forks. The alunimium forks are tuned to a 19 note scale derived from ancient modes created by Ptolemy. The overtones and harmonics created by the ringing tones of these forks ring around your room, completely enveloping you in their soundworld. This is perhaps Burt's most astounding recorded acheivement, and given his massive output, that gives you an idea just how special this is.